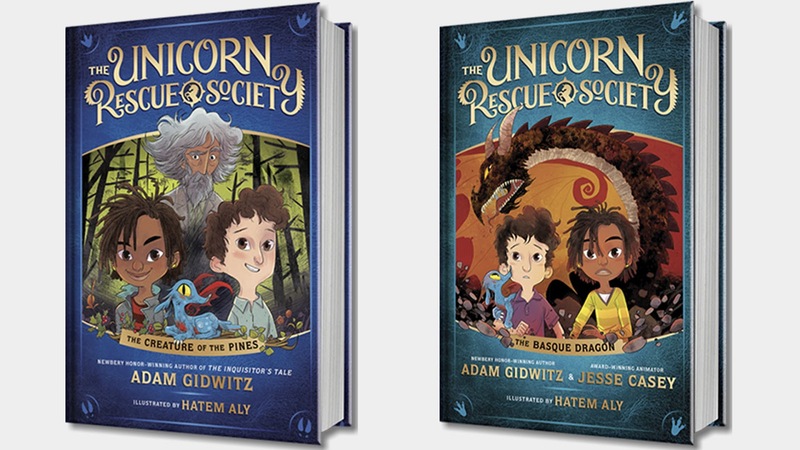 If you aren't already familiar with author Adam Gidwitz, you should rectify that immediately! His previous book, The Inquisitor's Tale: or, the Three Magical Children and Their Holy Dog, was a recent Newbery Honor, and he is also the author of the entertaining A Tale Dark and Grimm series. 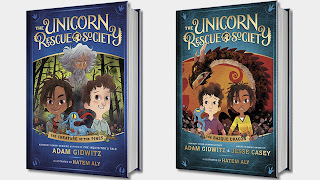 His newest series, The Unicorn Rescue Society, illustrated by Hatem Aly is a middle-grade fantasy (or, one could argue, magical realism) series. Book one is called The Creature of the Pines, and book two, The Basque Dragon, comes out in July. The book opens with a delightfully amusing premise in the form of a letter from the founder of The Unicorn Rescue Society, which, despite its name, has yet to find (or rescue) any unicorns. But they are certain that they exist. They must! Who wouldn't want to keep reading after an opening like that? From there, the book introduces new-in-town Elliot, who is dreading his first day: starting over at a new school in the middle of the year AND facing the chaos of a field trip on top of everything else. Thankfully, the open seat he finds on his morning bus ride happens to be with classmate Uchenna, whose experience being new last year makes her welcoming and receptive to a new friend. Together they discover that their field trip - and the mysterious Social Studies teacher leading it - may have more going on than it seems. Not only is this an entertaining read and a great hook for a series, but upcoming books will feature collaborations with a diverse array of authors each writing about mysterious creatures from their own cultural backgrounds. I cannot wait to read what Joseph Bruchac, Emma Otherguy, Hena Khan, and others have to offer! Definitely recommended for middle grade!